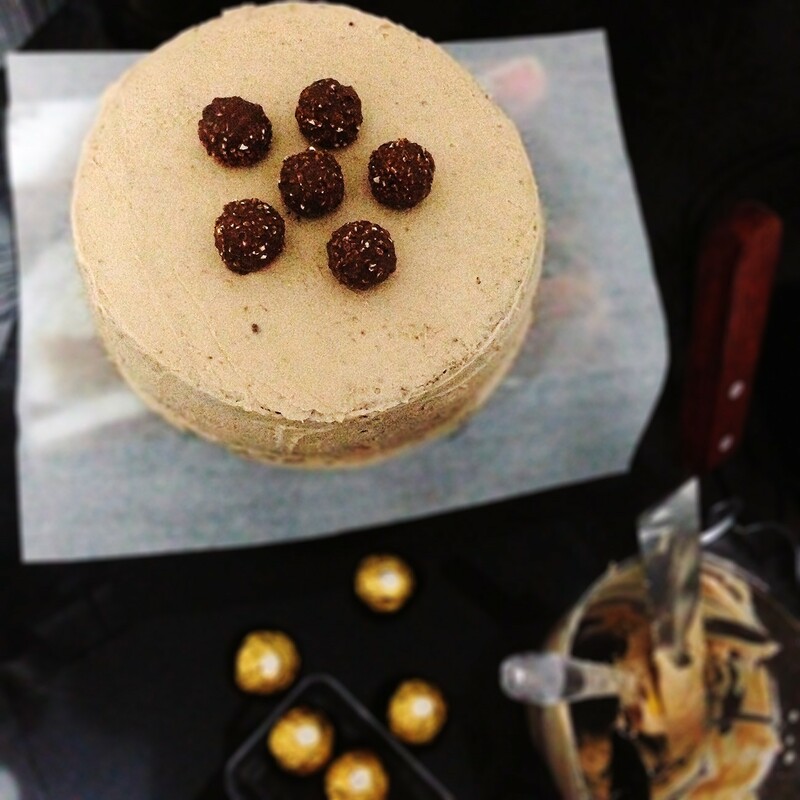 This cake will certainly appeal to all fans of chocolate, as well as lovers of timeless classics Ferrero Rocher. I must admit, variations on the theme "Cake Ferrero» set, and they certainly have their own nuances, different parts, and even feed ingredients in the composition. And only one thing remains unchanged - the chocolate taste and decorating chocolates Ferrero Rocher (usually :). I want to offer you my interpretation of the cake: a light sponge cake that melts in your mouth, delicate chocolate mousse (layer) and chocolate-hazelnut ganache (cover). Degree of difficulty, as for me - starting. So, do not be afraid, go for it! peanut butter with chunks of peanut - 2-3 teaspoons with a slide. Sift flour in a separate bowl, starch, cocoa, baking powder. Eggs and egg yolks, salt, sugar, put in a bowl (heat-resistant) and put in a water bath so that the bowl does not touch water. Stirring with a whisk, heat the mixture until 50-60 degree (if not the thermometer, then touch it with your finger - a little hot). The hot egg mixture beat with a mixer at high speed 2-3 minutes. The mass should be white and dense, increase in volume several times. Pour parts of the dry mixture to the whipped egg and gently stir in the scapula (no mixer!). Pour into a form of the laid paper, and bake in the oven 40-50 minutes (depending on the diameter and shape of your oven). Be sure to check the readiness as follows: Touch the sponge finger closer to the center, it should spring back and vmyatinka from finger to recover. Ready biscuit get it out of the oven. Give a little stand in the form, and then remove and cool completely. Gelatin (powder) soaked in water and leave to swell on 30-40 minutes. Melt chocolate in a water bath or in a microwave oven. Allow to cool to room temperature, stirring occasionally. Whip cream on medium speed until stable peaks. Subscribe to soft curd, whisk again. Add the cooled chocolate and whisk again. Swollen gelatin warm water bath or in a microwave oven until a homogeneous liquid state. Cool slightly. Pour the cream into the chocolate mass and mix well with a mixer or blender. Mousse is ready. Cream to warm, not boiling, turn off. Pour the hot cream finely broken chocolate. Wait until the latter is completely melted, and the mass becomes homogeneous. Cool in the refrigerator for a couple of hours. Beat at medium speed (weight should be "fluffy" and increase in size), add a couple tablespoons of peanut butter and continue mixing using a mixer. Korzh cut into 2 part (if necessary, trim the tip). One layer placed on the bottom of your split form (or a special ring) and fit the shape of clearly-sized cake. Top pour mousse (the layer will quite thick) and send everything in the fridge until the mousse did not grab (30-45 minutes). After this time, remove the structure from the refrigerator, put the second cake on top, a little pushing. Send in the refrigerator even minute 15. After carefully remove the ring / shape, having a knife along the rim. Украсить конфетами Ferrero Rocher по вашему вкусу. Также сверху торт можно посыпать шоколадной стружкой, орехами. Торту в идеале дать пропитаться минимум пару часов. PS Have a nice tea and chocolate mood!